A woman was killed as security forces dispersed a march by the Socialist Popular Alliance Party on Saturday in central Cairo. Shaimaa El-Sabag, one of dozens of marchers, was shot by pellets at close range, according to a statement issued by the party. The health ministry has confirmed her death. In a statement, the interior ministry denied that a policeman had gunned her down, saying marchers used fire crackers. "And later," the statement reads, "a woman was injured and hospitalised, but she died after succumbing to her injuries." The ministry went on to warn against such gatherings, warning that "terrorist groups" would infiltrate them with the intention of causing strife. 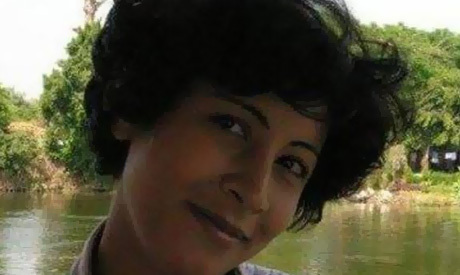 El-Sabag's body has been transferred to the morgue, while prosecutors have opened investigations into her death. A number of videos have been circulating online showing the deceased bleeding from the mouth. None of them show her being shot. Others were injured in the clashes which reportedly saw teargas fired by police, one day before the fourth anniversary of the 25 January uprising. The march was heading to Tahrir Square from the nearby Talaat Harb roundabout, before it was interrupted by police forces. Al-Ahram's Arabic website reported that at least six were arrested in the violence. Moataz El-Shenawy, Secretary General of the Socialist Popular Alliance Party, deplored what he described as "excessive force" by the police to disperse the march. He said marchers wanted to place roses in Tahrir Square, to commemorate protesters who had been killed there during the 2011 uprising. Over 800 people were killed in clashes during the 18-day uprising in 2011, which began on 25 January. A law passed by interim authorities in late 2013 bans all demonstrations not pre-approved by the police, resulting in the arrest of many protesters despite condemnation from freedom of expression advocates. El-Shenawy says the march was not authorised by the police but was announced in advance. Protesters held placards bearing one of the famous revolutionary slogans: "bread, freedom and social justice." They also called for retribution against the "killers of the martyrs." Earlier in the day, a microbus driver died during clashes between police and pro-Muslim Brotherhood protesters in Giza's Faisal district. we have been going through this for a long time now and will a long time still ....USA!!!! Very interesting. This is apparently a murderous regime that must go. If the regime stays in power a few more years, it will destroy Egypt and murders many many more innocent Egyptians. To all regime defenders: the dictatorship will kill you and your family without even a blink if it brings them a grain's worth of gain. Don't support murderers, they will murder you too without hesitation if it benefits them. Why are you so determined to become the tool of the corrupt? Let every body place roses on the spot where Shaimaa was killed.It's the duty of interior minister to tell us who is responsible about this painful incident ! Just label Shaimaa El-Sabag a member of the Muslim Brotherhood and give the security forces a promotion. This is the way to solve these kinds of problems in Egypt today. Please I suggest that no one jumps into conclusion and makes a judgment . Let the authorities investigate . Give the rule of law a chnace to work . It would be wise if no one make out of himself/herslf the and judge and the jury and the prosecuter as well . .